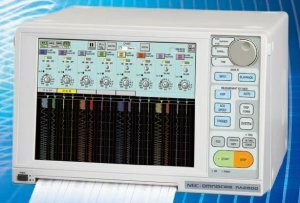 The A&D RA2800A Omniace Ⅲ (formally AVIO / NEC AVIO) is a data acquisition device that enables you to acquire/record data with simple operation. 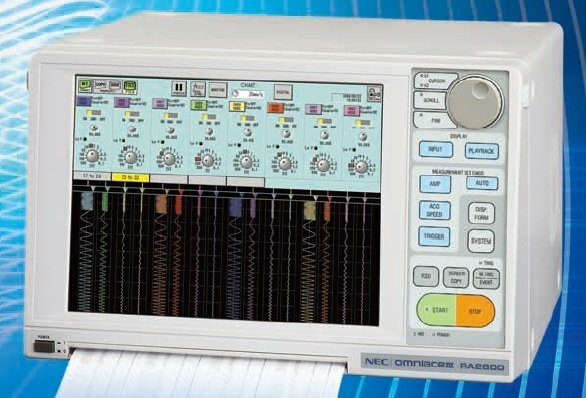 Reduced condition setting time and easy measurement can be realized by virtual amplifier setup, a touch-panel and dynamic waveform display on a large LCD. The RA2800A features with various measuring modes such as HD Recorder (for long-term recording on a 40GB HDD) or Memory Recorder (for fastspeed event recording). The RA2800A will bring you success in many measuring opportunities such as production line, quality inspection and R&D. Direct sensor inputs up to 32 channels (16 slots) are available for RA2800A and 16 digital input channels measure diverse signal timing and contact status. Long-term & high speed data recording by a built-in 40GB HDD(data capacity of 120 days when using 16 channels with 10ms sampling speed).